Guarding the entrance to Boothbay Harbor on Burnt Island. 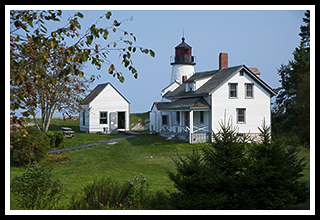 Some tours out of Boothbay are offered to explore the island and lighthouse grounds. Burnt Island Light was one of the earliest lighthouses built in the area to accommodate the increasing business at the fishing port in Boothbay Harbor. 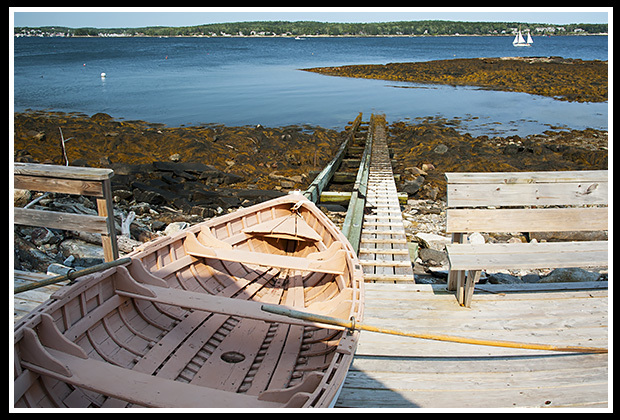 Most Keepers relished living at the island with its close proximity to Boothbay Harbor. The lighthouse has the oldest original tower in Maine, as Maine was part of Massachusetts until it was granted as its own state in 1820, and the lighthouse was built in 1821, making it the first lighthouse in the new Maine state. James A. McCobb was keeper from 1868 to 1880. He was a former sea captain who took the position at the age of fifty with his wife Martha. The keeper and his family loved life on the island until Martha died of cancer in 1879. McCobb’s attitude and disposition changed without his wife’s company, and would often complain about the many visitors who would visit the island. When he retired, due to his own health failing in 1880, Freeman Grover, whose descendants still operate Grover’s Hardware Store in Boothbay Harbor, replaced him. Joseph Muise was keeper from 1936 to 1951. He was originally from Nova Scotia, and also loved life on the island with his wife Anna and their children. He was a kind man and would always be happy, like most of the keepers, to help the local fishermen, who in turn would always provide his family with a fresh catch of lobster or fish. During Christmas, Muise’s family became recipients on the route of the “Flying Santa,” first by Bill Wincapaw, then by Edward Rowe Snow, who would fly over the island to drop presents for the family. In April 1962, Burnt Island Light became the last lighthouse in New England to be converted from kerosene to electricity, and it became one of the last Maine lights to be automated in 1988. There are many cruises and tours out of Boothbay Harbor that pass by Burnt island Lighthouse. A three-hour educational and fun tour is offered twice during the week days in the summer months, with the Balmy Days Cruises providing access to the island. This is all part of the Living History program to educate visitors and have them enjoy the new refurbished lighthouse and keeper's dwelling. The boat trip takes only 15 minutes out of Boothbay Harbor. Visitors are grouped together so everyone gets to meet the keeper, his wife, and the children all dressed in the period of 1950. They all help to explain what life was like at the lighthouse in that era (no plumbing..all year round!!?? ), the lighthouse history, and you can explore the island and be taken up the lighthouse tower for some great views of the harbor and nearby islands. You'll find the keeper's dwelling furnished from the period of 1950, along with buildings and boats as well. By the way, the actors are actually portraying an actual keeper who was stationed at the lighthouse during the period, Keeper John Muise, his wife Anna, and their four children. The Maine Maritime Museum also provides tours out of Bath to the area. This summer they will have completed a first of its kind exhibition of being in the lantern room as a full scale replica of Cape Elizabeth light with a second order lens. The room will have a time-lapsed video projection displaying a panorama of the Gulf of Maine that changes with the weather and seasons. 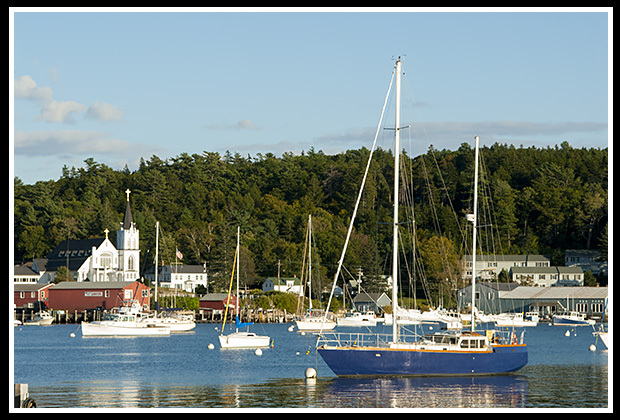 Boothbay Harbor region offers plenty of curio and specialty stores, quaint inlet harbors, with small coastal villages, like Southport, with plenty of local B&B’s to rest in. You will find plenty of boat cruises leaving out of the harbor for fishing, whale watching, and lighthouse tours covering the Kennebec River area and around Penobscot Bay leaving out of Boothbay Harbor. Take a left on Route 96 from Route 27 in Boothbay and follow it for about 10 miles to the end and you'll be treated to a special area referred to as Ocean Point, where you'll find yourself driving along the edge of where surf meets rocks along the shoreline. Look closely around the harbor and outer areas and you'll find lots of small eateries, coffee shops, etc., that may appear to be a private residence. It's these little special places that many visitors enjoy coming back to each year. Boat cruises mentioned below may offer many types of cruises coming out of Boothbay Harbor or the Kennebec River area. While some may offer specific lighthouse cruises that pass by the lighthouse, some may pass by Burnt Island Light as part of charters, narrated wildlife and historic tours, whale watching, fishing tours and other types of excursions. Provides a relaxing chartered pontoon boat for lighthouse excursions. Offers special lighthouse tours. Provides special access for 3-hour tours to Burnt Island. Offers various kayak tours including one to Burnt Island Lighthouse. 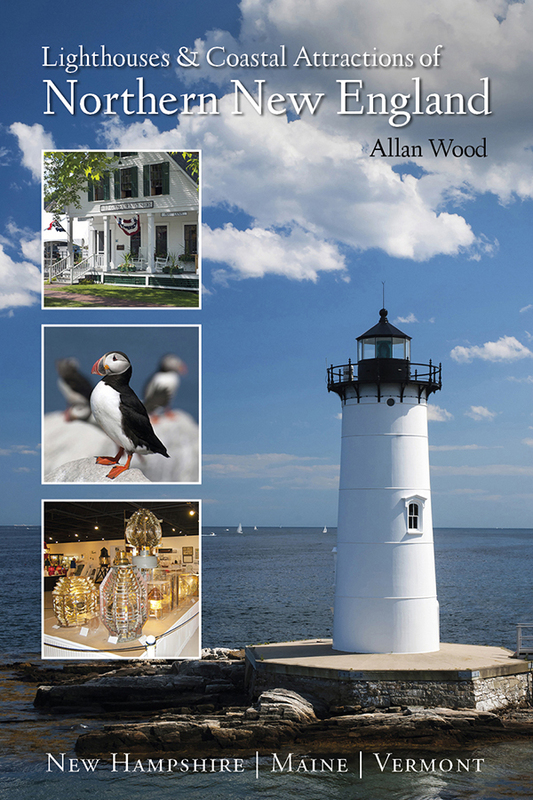 My 300-page book (with over 360 images), Lighthouses and Coastal Attractions of Northern New England: New Hampshire, Maine, and Vermont, published by Schiffer Publishing, provides human interest stories from each of the 76 lighthouses, along with plenty of coastal attractions and tours near each beacon, and contact info to plan your special vacations.